Self-inflicted car insurance wounds: I crashed into myself! 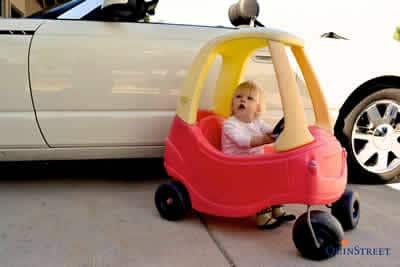 Home > Car Insurance > My daughter crashed her Little Tikes Cozy Coupe into my car, scratching the door. Can I make a comprehensive claim? My daughter crashed her Little Tikes Cozy Coupe into my car, scratching the door. Can I make a comprehensive claim? This is one car accident that probably won't be covered by your auto policy. Be prepared to reach into your own pocket or settle up with your child. Unless your daughter carries a liability policy for her toy car, you're probably out of luck, says Lehman. "Can you make a claim?" he asks. "Sure, but the likelihood of damage exceeding your deductible -- if one applies -- is highly unlikely." My wife backed out of the garage and hit my car in the driveway. Can we make a claim on our liability policy? Another car hit my door as I was opening it. Whose insurance pays? I crashed into my own garage door. Will I need to make a collision claim for my car and a home insurance claim for the garage door? I smashed my hand in my car door. Can I make a bodily injury claim on my car insurance? I left my engine running while I ran into a store, and somebody stole my car. Will comprehensive insurance pay my theft claim? I left my emergency brake off and my driverless car rolled down the driveway and across the street, into my neighbor's tree. Will my car insurance pay for the damage to my car and what about the damage to the tree? I crashed a car while on a test drive. Whose insurance pays? 0 Responses to "My daughter crashed her Little Tikes Cozy Coupe into my car, scratching the door. Can I make a comprehensive claim?"